Geotag silt curtains are used as protective barriers in marine environment to control pollution caused by suspended sediments, such as silt, soil or stone dust. Most of the time, rain water run-off during construction creates sediment in waterways, silt curtains are used to contain this suspended sediment. By confining the sediment to a specific area, the rest of the waterway is then protected from the damaging effects of pollution. 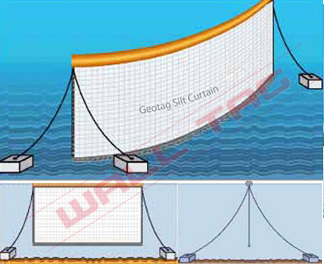 Geotag Silt Curtains is used in marine construction, pile driving, site work and dredging activities. Wall Tag is a leading supplier of Silt curtains in Singapore. Wall Tag has a strong supply chain network for Silt curtains all across Singapore. Kindly contact us for quotation. Geotag silt curtains is a flexible high strength woven membrane that is suspended by floats in the water together with the mooring system to stabilize the whole silt curtains system.